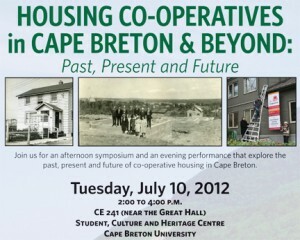 Two events on housing co-ops are taking place at Cape Breton University (CBU) this summer. Organizers are extending a warm invitation to all those involved in the credit union and co-op sectors! From 2:00 to 4:00 pm on July 10th, a symposium is being held with presentations and a discussion on the past, present and future of co-operative housing in Cape Breton and beyond. Speakers include Richard MacKinnon of CBU, Karen Brodeur of the Co-operative Housing Federation of Canada, John Aylward of Venture Solutions, and Jim Mustard from Inverness County. Beginning at 7:00 pm on July 10th, the Journey to Tompkinsville will be presented at the Boardmore Theatre by Lindsay Kyte and Ian Sherwood. The events are free but participants should register by July 6th by emailing alicia_lake@cbu.ca or calling 563-1661. More information can be found by clicking here.